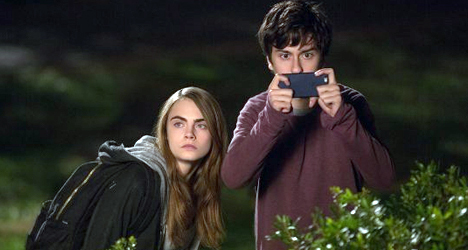 Cara Delevingne and Nat Wolff are up to no good in "Paper Towns." As the go-to source for screenplays on young love, screenwriting partners Scott Neustadter and Michael H. Weber have had a sizeable amount of success. 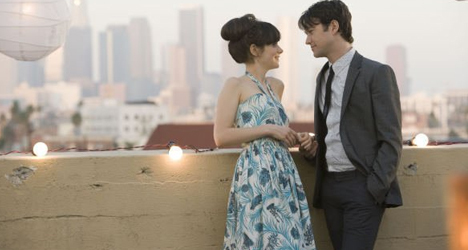 With “(500) Days of Summer,” “The Spectacular Now,” and most recently “The Fault in Our Stars,” Neustadter and Weber have, for the most part, been able to subvert clichés and avoid tropes to deliver earnest and unique films about love. 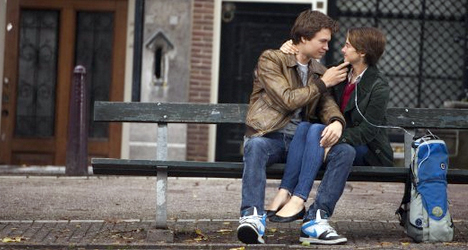 With another novel adaptation from John Green, “Paper Towns” is perhaps the first truly inauthentic step from the duo. After drifting apart from being childhood friends, Quentin (Nat Wolff) is visited by free-spirited, rebel teenager and neighbor Margo (Cara Delevingne) in the middle of the night. Needing his Mom’s car to exact revenge on her cheating boyfriend and friends, the conservative do-gooder Quentin agrees and has the best night of his life on mischievous adventures. Hoping to further nurture a childhood crush, Quentin wakes up disappointed the next day to find that Margo has vanished. He does, however, find clues that may point to where Margo is hiding and joins up with friends on an adventure to track her down. In her first starring film role, model turned actress Delevingne is a welcome revelation. With a twinge of attitude and raspy voice, there’s a certain Emma Stone quality to Delevingne’s performance that shows a lot of potential. It’s a shame that she’s gone for the majority of the film, as her performance is the most intriguing part of the film. Something else that is welcome is Wolff finally being in a likeable role. After turning in the most annoying character of all time in “Palo Alto,” Wolff gets to play not only charming, but vulnerable and proves to be quite good at it. 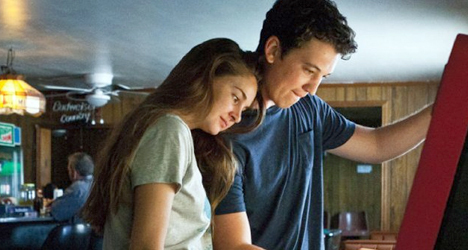 Unfortunately for “Paper Towns,” the levels of performance are where its successes end. 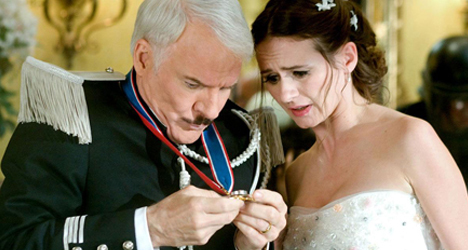 With teen films, there is always the risk that writers and directors become so concerned with being different that they pack their characters and stories with quirks and eccentricities that would never exist in real life. This is where Neustadter and Weber have been successful in the past, showing uber romantic gestures, but still believable teenage (or young) relationships. In “Paper Towns,” however, it all seems for naught. More to the point, Neustadter and Weber do a poor job of establishing the relationship between Quentin and Margo. (What is the purpose of them finding a dead body if nothing at all comes from it?) Quentin’s alleged love for her that makes him want to go on a manhunt across the country, even after their one night of fun, rings completely false. They haven’t even talked since they were kids! Essentially what he is doing is giving in to the whims of an “eccentric” girl that ran away, which is hardly a reason the viewer to care. Beyond all of that, there’s an annoying streak that runs throughout the film. One several occasions, gorgeous people complain about having to live up to their expectations and how people only see their coolness and their beauty. It’s a form of self-pity that is, quite frankly, obnoxious. One of the side characters in particular has one of these moments, and it is amplified by a sideplot of a relationship with one of Quentin’s best friends in a storyline that is, once again, completely unbelievable. If there is any word that can sum up the experience of “Paper Towns,” it is “pointless.” When the entire plot of a film hinges on a relationship that is impossible to buy into, it’s really hard for the whole thing to not feel like a mammoth waste of time. There’s no fun or energy behind anything that is happening, and almost none of its relationship moments are earned. The ending has a hint of refreshingness to how blunt it is, but it also, in a way, further cements the fact that the rest of the film was unnecessary. Unrealistic, annoying, and emotionally hollow, “Paper Towns” is as thin as its title suggests.